Okay, maybe this isn't the original "Bat" roller coaster which was a very early prototype of the 'suspended-swinging' coaster. However, it will breath new life into a fan favorite attraction- Flight Deck. On this day, 33 years ago in 1980 the original "Bat" opened to the public. As you can see, it was a pretty amazing ride but being a 'new style' it was plagued with problems. The track wasn't angled enough and the mechanics that allowed the car to 'swing' wore out very quickly because of this. If you check out the video, you can see it was a wild ride! The Bat flew it's last run in 1983 when it was demolished.. currently Vortex sits in it's place, reusing the original ride building. If you look around carefully, you can still spot peices that 'The Bat' left behind in that area. Finally dumping the steel gray look and the old left-overs from the paramount days, Kings Island is completely re-themeing Flight Desk with a new 'Orange, Two tones of Steel Gray and Black" color scheme and very likely, re-themed ride trains! Not only does "The Bat" fit in with the new "dark" theme which the park seems to have going, it's going to mesh beautifully with it's new big sister, Banshee. This is a perfect answer for an excellent coaster. 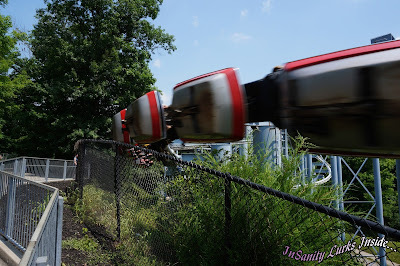 Rather then seeing an already rare type of coaster disappear, the park is giving it a much needed infusion of life. Yes, it's the same ride but it's also paying homage to it's ancestor and I can't think of a ride that deserves more love then Flight Deck! 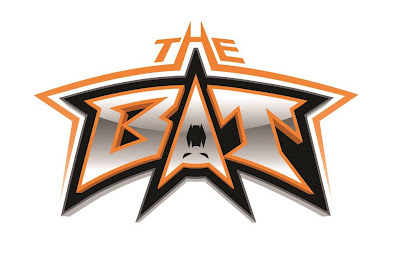 ...Okay and 'The Bat' had about the coolest logo around, both new and old!